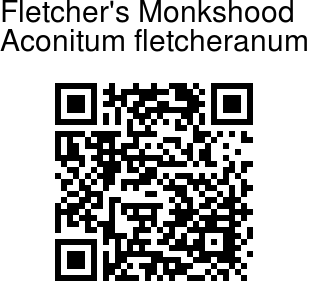 Fletcher's Monkshood is a perennial herb with rhizome round, branched. Stem is 5-19 cm. Leaves are all basal; leaf-stalk 2.5-14.5 cm, slender, hairless, base sheathed; leaf blade round-heart-shaped or kidney-shaped, 1-3 x 2-4 cm, palmately or pedately 3-5-parted; lobes obovate-wedge-shaped, 2- or 3-lobed; ultimate lobes ovate or oblong, tip pointed or mucronate. Flowering stems are 1-4, erect, 6.5-14 cm tall, distally retrorse velvet-hairy; bracts 2, stalked, similar to leaves but smaller, at distal part of flower-stalks. Flower occur solitary, at branch-ends. Sepals blue-purple, hairless or below sparsely velvet-hairy; lower sepals broadly obovate, or nearly round, about 2 × 2 cm; upper sepal boat-shaped, shortly beaked, about 3 x 0.9-1.2 cm from base to beak. Petals about 2 cm, hairless; claw slender; limb about 3 mm; lip very short, entire or slightly concave; spur narrowly cylindric. Stamens are distally finely velvet-hairy or hairless; filaments broadly lanceshaped. Carpels are 6-8, sparsely velvet-hairy. 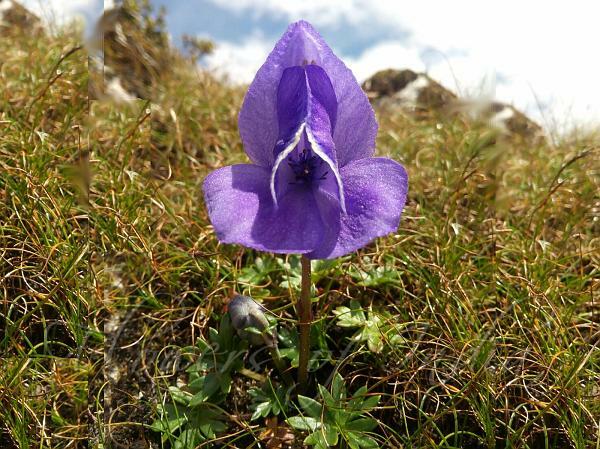 Fletcher's Monkshood is found in wet places on slopes, grassy slopes in Eastern Himalayas, Bhutan and NE India, at altitudes of 4300-5100 m. Flowering: July-October. Identification credit: Magnus Lidén Photographed in Arunachal Pradesh.